Most car owners are well aware of the need to get an oil change every 3,000 miles. Many are aware of the need to check on the coolant level for the radiator to make sure it is full. However, there are lots of other automotive fluids that some car owners don’t even know exist. Fortunately, many of these fluids will get checked out, topped off or replaced after a trip to the mechanic or local lube shop. 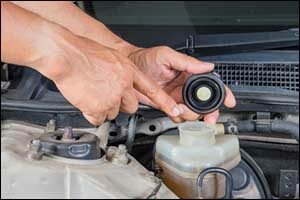 But for car owners who do their own oil changes at home with supplies from their local Fall River auto parts and services shop, it is important to make sure that you know about all of the fluids and filters that need to get checked and changed on a regular basis. Each vehicle is different, so it is essential that you get the right type of fluids for your particular car or truck, just as you need to get the right car parts and accessories. If you aren’t sure what you need, stop by LaCava Brothers Auto Supply in Fall River and our team can help you get the right supplies. We keep all of the standard parts, fluids, tools and accessories in stock and can even help you get hard-to-find products designed to work with your particular year, make and model. We even provide supplies to local mechanics, so you know we have the name brands you need to get the job done right. Ignoring the needs of your vehicle, such as getting the right fluids, making sure the chambers are filled up to the right level, and that other fluids are changed out and replaced according to the recommended maintenance schedule from your manufacturer, can spell disaster. Proper fluid changes at the suggested intervals can help to prevent breakdowns and increase the life of your vehicle. While engine oil and coolant are perhaps the two most important fluids needed by your vehicle, you need to know about these other essential fluids and know how and when to change them accordingly. Automatic Transmission Fluid – This fluid is essential to your car’s operations, as it lubricates and protects the gears of your transmission. This fluid also contains detergents that work to trap contaminants that could cause damage. When the fluid gets changed out, the contaminants are removed. This is why it is vital that you get regular automatic transmission fluid changes according to the manufacturer’s recommendations. If you don’t get the right fluid from your local auto supply in Fall River, the transmission won’t work properly. There are many different types of transmission fluid to choose from, so you want to check with LaCava Brothers to make sure you get the right type. Brake Fluid – One of the most destructive contaminants that can affect brake fluid is moisture. Unfortunately, brake fluid is “hygroscopic,” which simply means that moisture is attracted to it. Moisture in brake fluid can lead to corrosion of parts, which can eventually cause system failure. There are many different types of brake fluid and the frequency of changing it will depend on the type of fluid and the manufacturer’s specifications. You can check the intervals and other requirements in your owner’s manual or by looking online. LaCava Brothers can help you get the specific type of brake fluid your vehicle requires at our auto supply in Fall River. Power Steering Fluid – The entire power steering system relies on a pump and fluid, so if you are low on power steering fluid, you will know it. One sign is that you will hear a loud groan under the hood when you attempt to turn the wheel. Another is that it will feel like you are getting the most intense upper body workout just by trying to make a right or a left turn. If you don’t check the levels of your power steering fluid to make sure it is properly maintained, you could end up causing damage to the pump. Your owner’s manual should help you find the power steering fluid reservoir so you can check the levels with the dipstick. You can find many different types of power steering fluid where you purchase car parts and accessories at LaCava Brothers in Fall River. In addition to these essential fluids, there are still other fluids that you will need to check. Engine oil, radiator coolant, windshield washer fluid, and drivetrain fluids, which include the differential, transfer case and transaxle fluids. 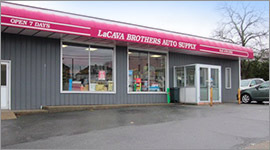 Stop by LaCava Brothers to take a look at our wide selection of Fall River auto parts and services. Our team can help you get all of the car parts and accessories or fluids and filters that you need to keep your vehicle running as it should. Give us a call at 508-676-1951 or stop by our location on Bedford Street in Fall River, Massachusetts. ← LaCava Brothers Asks: Are You Ready for Winter in Fall River?